The Met has opened this season with a slightly belated acknowledgement that a lot of blackface is not a good look for a big mainstream American institution. 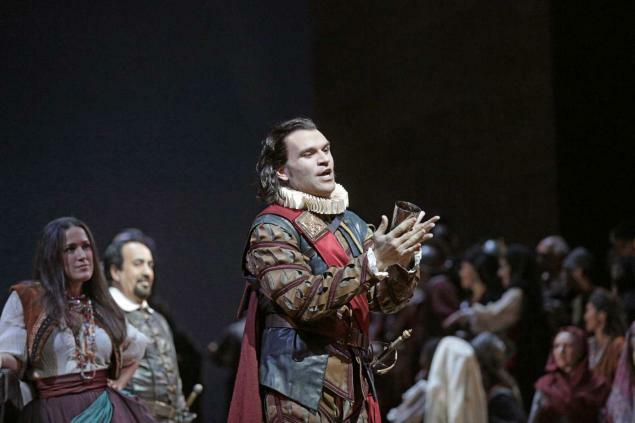 Unfortunately the resulting pale production of Otello, which opened on Monday and I saw on Thursday, doesn’t have anything else new to say. The production does, however, have a major selling point, one that hasn’t been nearly as widely discussed: Yannick Nézet-Séguin’s electrifying conducting. 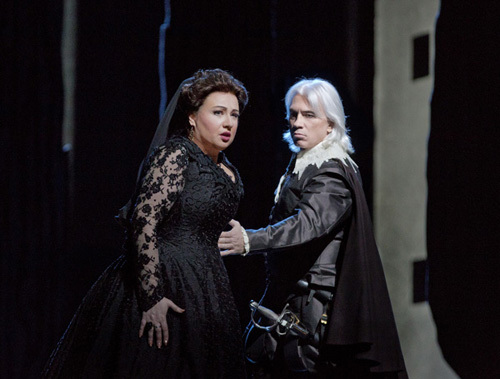 Don Carlo is a big and ambitious opera for Opera Philadelphia, even in the four act version. 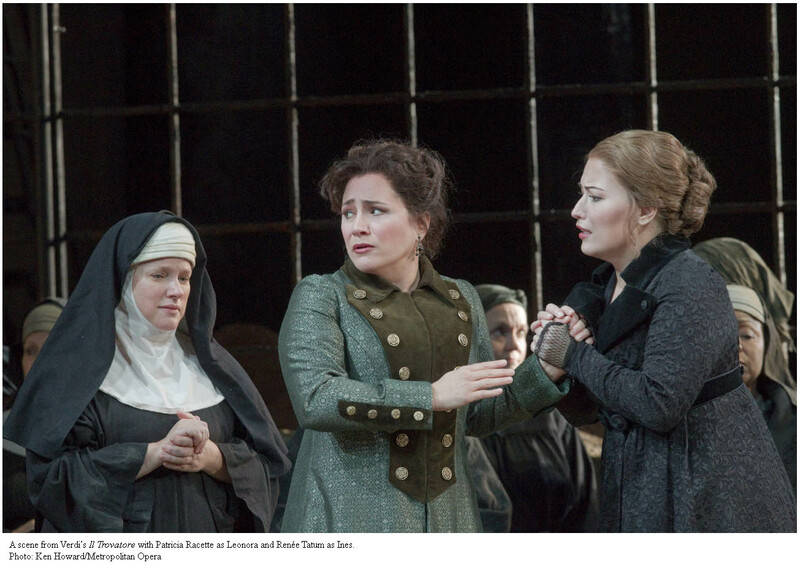 I’m happy to report that with this production the risk has paid off: the cast, led by Eric Owens and Leah Crocetto, does the best singing I’ve heard from Opera Philadelphia in years. Tim Albery’s generic period production is rather bland, but it’s well-acted and appropriately dark. In a city which has long been dismissed as “not an opera town,” this is a production any regional company would be proud to perform. Was it mere coincidence that both operas I saw during my holiday weekend in Germany both considered free will and fate? 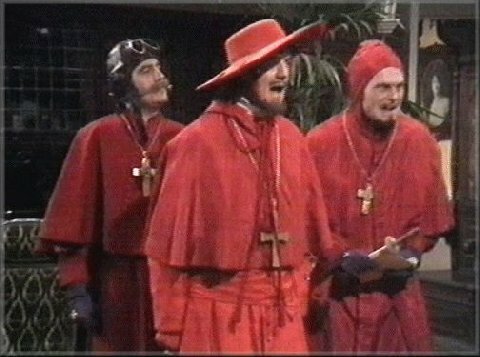 Or was it…. something more? Meh. 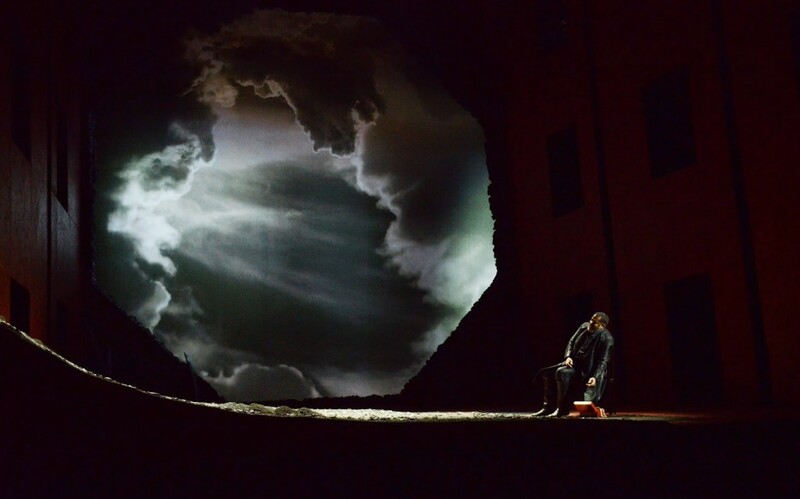 There’s none of Hans Neuenfel’s ambiguity on the fate question in the Bayerische Staatsoper’s production of La forza del destino. For director Martin Kusej, fate as explication–particularly when wielded by organized religion–is a handy tool of oppression by the powerful. It’s an interesting production, and more notably this was an unusually excitingly sung production of an exceedingly tricky opera. I love Forza; I think it’s a fascinating and ridiculously underrated piece that presents enormous musical and dramatic interest and possibilities. (I’ve written about it before.) 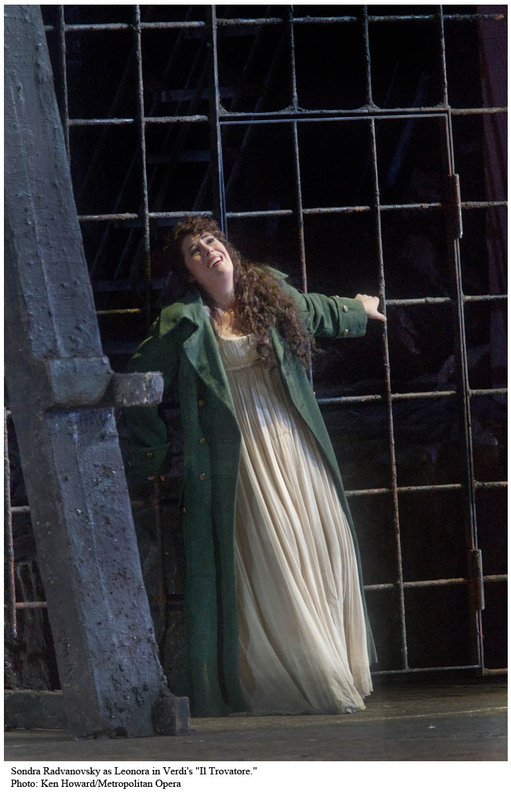 The, er, “plot” is convoluted and sometimes seems to entirely disappear, as do major characters for acts at a time; the tone swings wildly between the most solemn late Verdi drama and La fille du régiment. It’s the biggest argument against Verdi as a dramatist who operates solely in simple and literal terms. He obviously has more abstract fish to fry here, and a staging that doesn’t reflect this complexity… well, maybe that’s why this opera’s reputation is so bad. Martin Kusej’s production does make a real attempt at dealing with meaning, though in the end I found it to be something of a hedgehog at loose in a fox of an opera. Like the everpresent table onstage, everything comes down to the destructive effects of patriarchal and religious authority and control. We being with a solemn family dinner at that table, presided over by the Marchese with a prominently placed cross (above). In contrast, Leonora’s forbidden boyfriend Alvaro is quite disreputable-looking and seems to exist well outside the system. 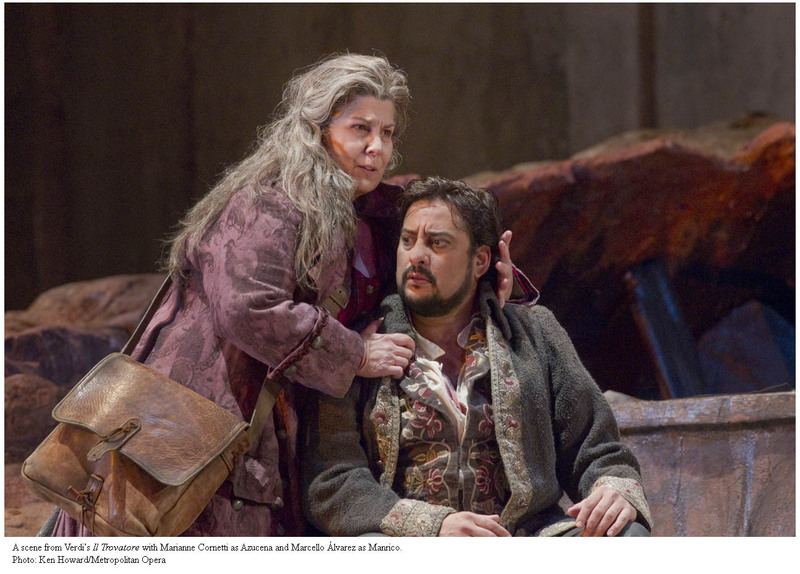 Act 2 seems to be constructed of remanants of this first act in a dream-like way–Leonora’s maid Curra becomes Preziosilla, Carlo grows up (and eventually loses the dorky green sweater), the Marchese becomes the Padre Guardiano, and one of the mysterious dinner guests turns out to be Melitone. Leonora still can’t escape, it seems, and finally submits to the Church (as represented by her dead father, the Marchese/Padre Guardiano) in a baptismal dunking apparently lifted from an American church. 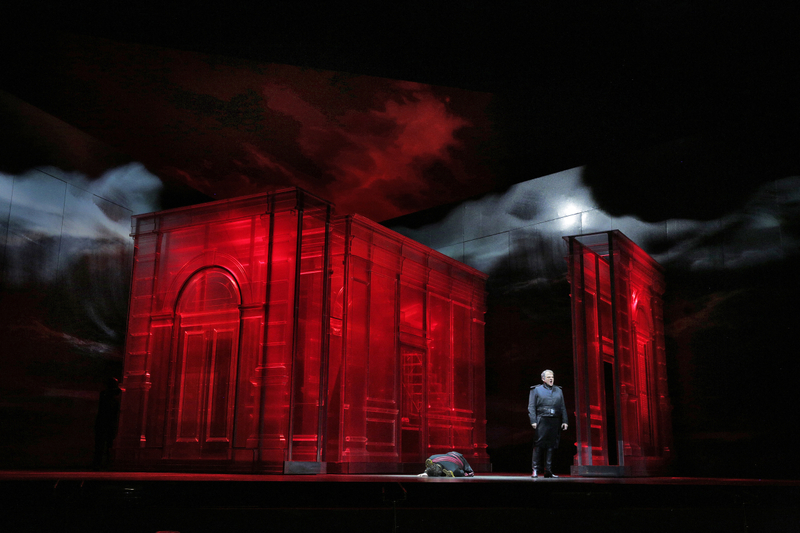 The Act 2 inn set evokes a 9/11 disaster photo, prefiguring the American tone of Act 3, which leaves Leonora for an Iraq-like war. This act begins with a startling tableau of images familiar from the US in Iraq. It’s an apt setting for a chaotic conflict that depends on personal trust. (For an American for whom such things remain open issues, the torture stuff felt underexamined and gratuitous–I don’t think I’m ready to see anything about this as a symbol yet. But it was gone fairly quickly.) 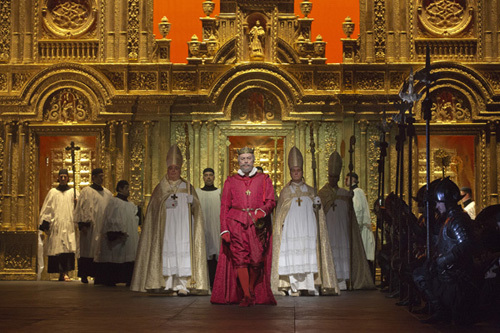 The staging of the Alvaro and Carlo scenes, however, is strong and intense (what I saw of it). Fortunately, the last act is more effective. Alvaro can’t talk Carlo into forgiveness and Leonore, adrift on a giant pile of white crosses, is not granted her wish for peace. While the Marchese/Padre Guardiano does his blessing duty, Alvaro is no longer convinced of the redemptive power of faith, and ends up throwing one of those crosses on the ground and leaving in despair. While this production was interesting, the performance’s biggest reward was the singing, more glamorous, charismatic, and committed than you usually hear in this rep. If only the cast hadn’t been consistently counteracted by Asher Fisch’s uninspired conducting. While he and the orchestra got off to a strong prelude, elsewhere he proved too laid-back for his own good, failing to build to climaxes and lacking in energy. This particularly dogged the choral scenes, which tended towards the limp. The chorus, though, was excellent. 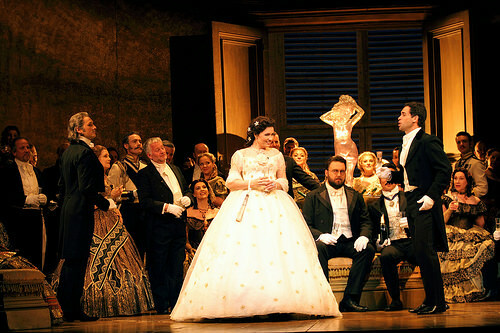 Anja Harteros deservedly received the largest ovation for her Leonora. 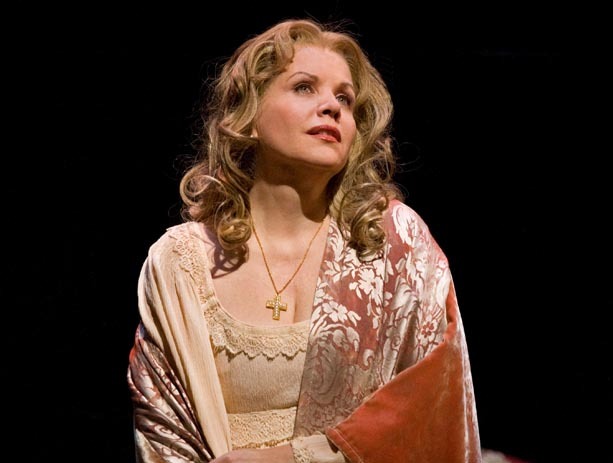 The role suits both her big, dark, slightly grainy soprano and her introverted temperament: she always seems conscious and in control of everything she does, and Leonora here is someone who has never been able to express herself freely. While she doesn’t have the vocal warmth or round sound of a more Italinate soprano, she sounds absolutely like herself and is wonderfully musical. While she doesn’t always have the greatest high notes, the ending of her “Pace, pace” was terrific, and she doesn’t shy away from chest voice, either. 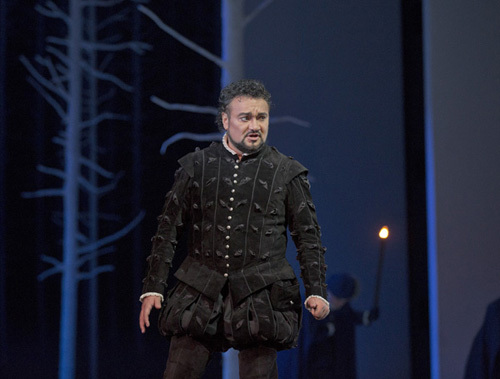 No one would accuse Jonas Kaufmann of being Italian either, but his muscular, forceful tenor and surprisingly bright upper range is perfect for Alvaro’s tortured character. He was also endlessly energetic compared to the more withdrawn Harteros (as well as far greasier-looking compared to her elegance). “Tu, che in seno agli angeli” featured some terrific high soft singing. 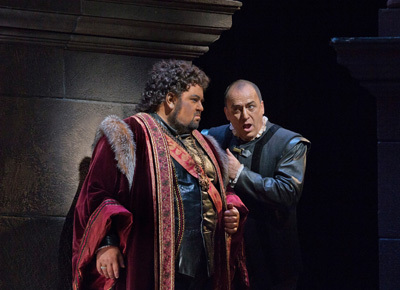 As Carlo, though, Ludovic Tézier was somewhat overparted and sometimes resorted to barking, as well as struggling with the fioriture in “Urna fatale.” He did his best singing in the duets with Kaufmann, where they blended well. 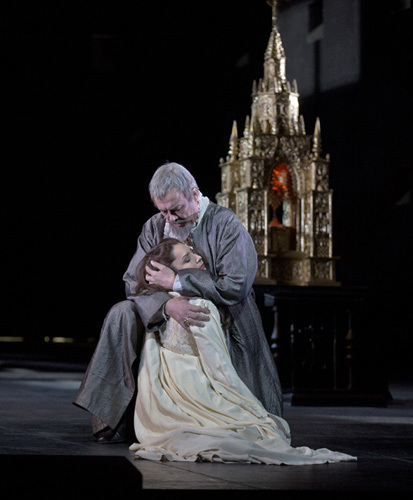 The supporting cast was good: I kind of wondered what had happened to Vitalji Kowaljow after I heard him sing a pretty strong Wotan a few years ago, and it turns out he is a solid Verdi bass as well. 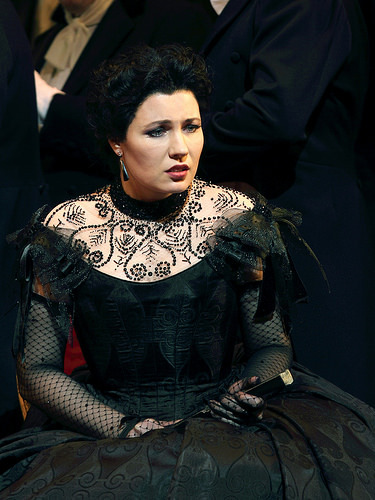 This was the second time I heard Nadia Krasteva as Preziosilla, and while she has the right kind of spicy tone and sass for it and can hit all the notes loudly, she had an awkward break around the bottom of the staff that impeded her Rataplan. 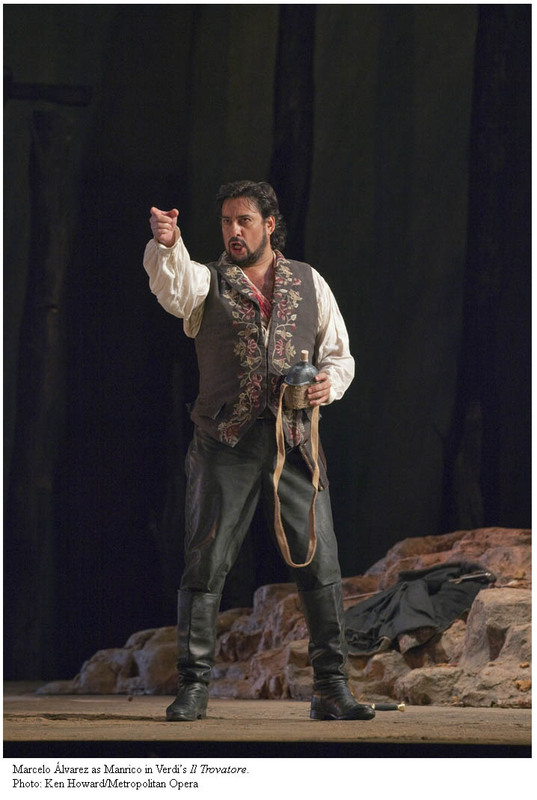 Renato Girolami did nothing to make Melitone seem very necessary, but nor was he annoying. It’s a shame there isn’t going to be a DVD of this. I’m very glad I got to see it in person. This Sunday, I will be speaking about blogging and the Verdi anniversary on a panel at Verdi’s Third Century, a conference put on by the American Institute for Verdi Studies (at New York University). In the spirit of blogging, this discussion wouldn’t be complete without your thoughts! 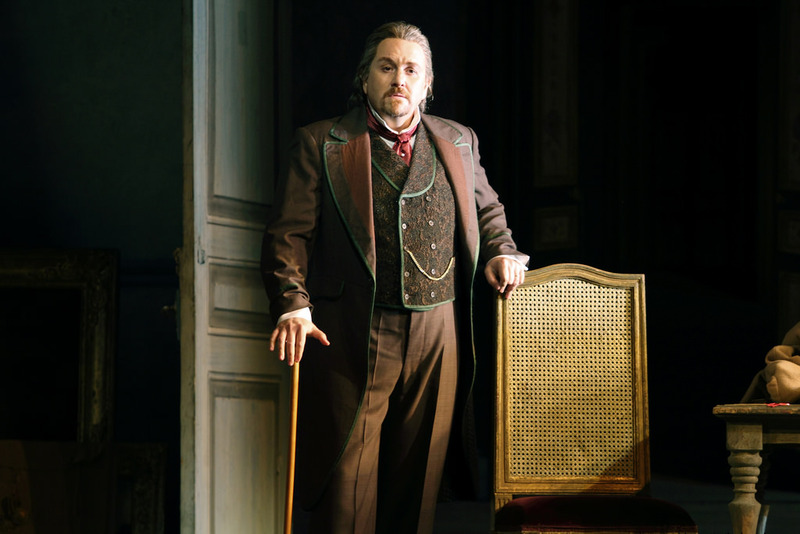 I would like to talk about how the Verdi anniversary has been recognized outside academia, and would love to hear your thoughts, recent Verdi experiences, and so on (comment at the bottom of this post!). I asked around on Twitter a few days ago and got some interesting thoughts. Many immediately confirmed my initial suspicion: Verdi Year mostly means seeing more Verdi. 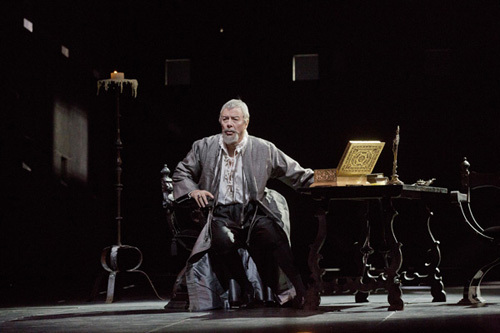 Verdi is at the core of most modern opera houses, and a few more Traviatas and maybe a Stiffelio tend to sneak into people’s schedules without a major fuss. First: a lesson on social media. I put this question up around 8:30 in the morning, before I started work. No one responded. A few hours later I wondered out loud if that meant no one cared, and it turned out I was just too early, and suddenly everyone wanted to chat (this explains the tweet everyone is responding to below). Thanks to a retweet from the Royal Opera House, I got a lot of British responses. 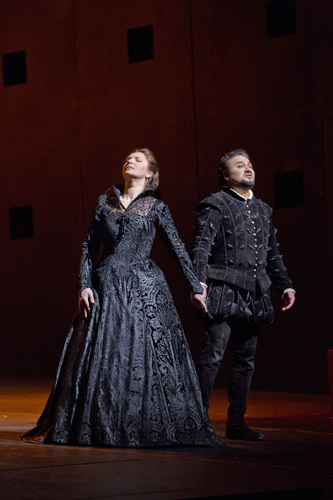 @RuthElleson @ZerbinettasBlog Possible problem: for many companies, every year is Verdi year? 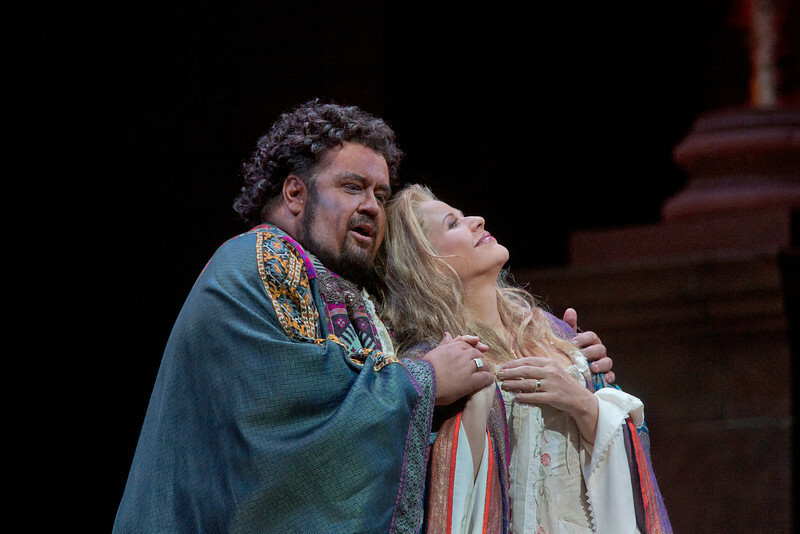 I’ve seen Rigoletto & Aida this year, but…! 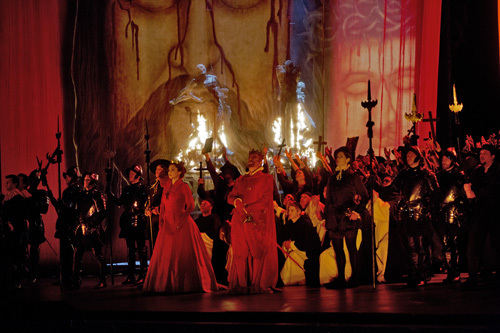 @ZerbinettasBlog Verdi Year = waaaaaaaaaaaaay too many Requiems…. There’s also the 800-pound gorilla: Wagner. 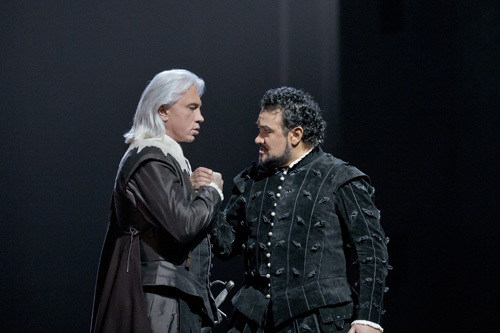 Verdi had competition, and seems to have been the less recognized of the two. 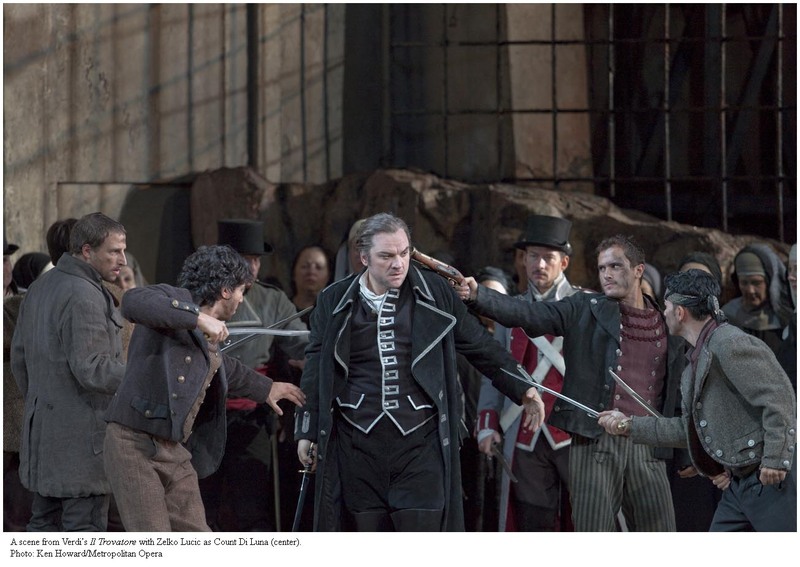 @ZerbinettasBlog I think Verdi has been received shoddy treatment this bicentenary year, especially in the UK. @ZerbinettasBlog @singingscholar > whereas in my experience,Verdi obsessives are more interested in what their favourite singers do with it. 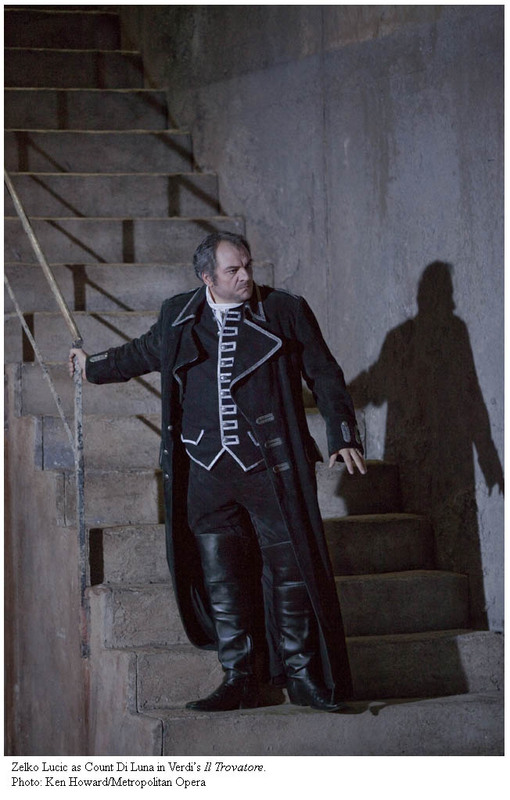 What has Verdi done for you recently? Please leave a comment or email me at likelyimpossibilities at gmail.com.